1984 Blue Bird FC35 Blue Bird Wanderlodge for sale in Grants Pass Oregon 97526 . Recreational Vehicle for sale. Along the way, Automania has met some incredible people who have become good customers and friends. They are not just nice people, but their passion for motorcycles, cars and other motorized endeavors is one shared by us. This 1984 FC35 (front engined, 35’ Long) Blue Bird Wanderlodge, known as “Cramalot Inn” is from a small fleet of vehicles we have had the pleasures of representing and finding new homes for in the past few years. It is owned by a mechanically passionate individual attracted to the character and condition of unique vehicles and the means to own, maintain and properly store them. I was invited to take the images of the coach that you see here with the description listed below. It was hard to imagine that anyone would be excited at the idea of seeing a 30 year old motorhome, but while watching it back out of the indoor storage building, it was hard not to fall in love with the bus as more and more rolled out into the sunlight. The nature of Blue Bird owner’s, because of their original cost and exclusivity, is one of almost fanatical love and appreciation of the build quality and sophistication built into the Wanderlodge at the time of it’s inception. The first time entering the coach was like visiting a aero space museum and witnessing the wood, controls and layout of a veteran luxury aircraft build quality that today’s computer generated, plastic extruded, vinyl wrapped modern coaches have nothing in common with. It took a little time to soak in. The second thing I noticed was the preserved condition and excellence that was shown from obvious maintenance and service attention given by every owner since the coach was new. It is not just a coach, it seemed almost a mechanical shrine. I am not going to begin to pretend I know the specifics of the coach or even how to operate the myriad of controls shown in the images. The owner was kind enough to send the specifications and history of “Cramalot” which is below. If you have any questions that are not covered, please give us the chance to answer them as completely as possible with the assistance of the present owners. The selling price is $29,995. For other interesting bikes and collectable vehicles, visit our web site http://www.automaniagp.com 541 479 8888 or come by and see us at 895 SE Gladiola Drive, Grants Pass, Oregon, 97526. Oregon Dealer DA1287. 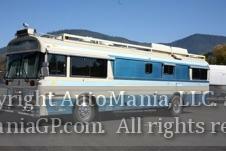 You are viewing a listing for a 1984 Blue Bird FC35 Blue Bird Wanderlodge for sale in Grants Pass Oregon 97526 on AutoManiaGP.com. We encourage you to contact us by phone, email or text to get more details and how to purchase the unit.